If You have new printer models not supported by WIC utility or Your printer has new main board and it can't be modified by WIC utility - You have to use this solution. 100% working for this printer models for making printer chiplesss - no ink firmware. but I didnВґt receive yet. Do you know what is happening? I purchased an Activation Key for my Epson XP-441. I have been sent, but I do the procedure appears the error (COMMUNICATION FAILED. PLEASE, CHECK CONNECTION BETWEEN PRINTER AND PC. CHANGE USB PORT. CHECK NETWORK CONNECTION, MAKE SURE THAT PROXY IS NOT USED AND DISABLE FIREWALL. TRY AGAIN LATER. 10091) Do you know what's going on? 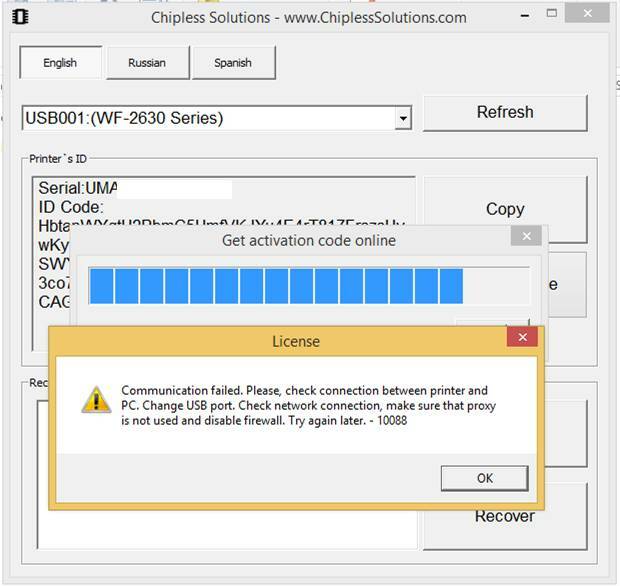 I purchased 2 total chipless firmware codes for the Epson SC P800. I purchased one first and went through the directions. The process was successful and worked properly. However the second key although seemed to have installed everything without issue does not work. Does this mean that the key is faulty or another issue. Can someone please get back to me. I want to purchase many more I even inquired about bulk pricing however I cannot move forward with a 50% failure rate please help. Already fixed the problem on server side. I purchased an Activation Key for my Epson XP-241. I follow the procedure but na error appears:(COMMUNICATION FAILED. PLEASE, CHECK CONNECTION BETWEEN PRINTER AND PC.CHANGE USB PORT. CHECK NETWORK CONNECTION, MAKE SURE THAT PROXY IS NOT USED AND DISABLE FIREWALL. I deactivated all firewall. Do you know what's going on? Hello, my problem is it: "communication failed...... try again later error 10060"
hello, I still have the same problem, is the server with problems or is my problem? 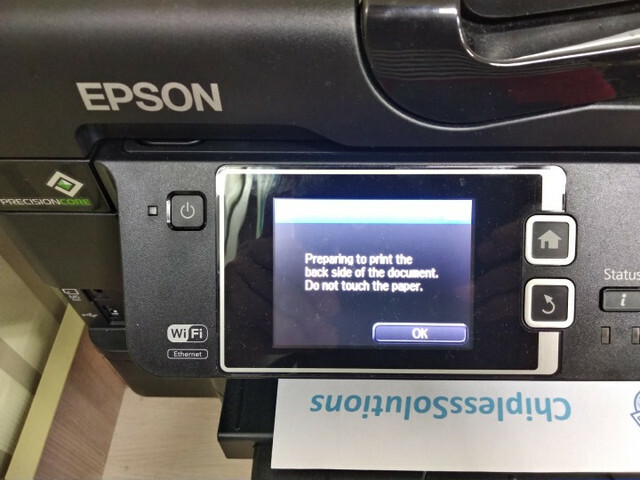 Hello, I already installed another epson xp 231 and I had no problem, but with the last serial I get that error, I have neither proxy nor firewall. I am using the same PC that I used for the previous printer that installed the chipless without problem. Hi i have a problem with chipless XP-440. In my opinion internal color profile for glossy papers is not 100% correct. On both original and chipless firmware printer gives strong blue tint if selected profile is glossy. But everything works just fine if matte profile is selected for glossy papers. Sometimes it becomes a problem because often printer and Epson iPrint don`t allow to select matte paper if it's size is 10x15 i.e. standard photo. I have tested XP-342 with the same ink and paper and everything was just fine with both glossy and matte profiles. In my opinion it might be a mistake in original XP-440 FW which was transferred to chipless one. Do you have a chipless FW for XP-440 based on newer original FW which may be free of this problem? Thanks. Two days ago I started a firmware upgrade (with a 3rd party black ink cartridge installed) on my WF-4734. The upgrade halted in a вЂњMaintenance ErrorвЂќ mode with a message that it вЂњCannot recognize ink cartridge. Try installing again.вЂќ No matter what I do, I canвЂ™t get out of that error mode. After I found your web site, I downloaded your WF4730_FWF475TL_CM13I2.zip file, unzipped it and tried following your directions. I was not able to enter the вЂ?special Firmware Update ModeвЂ™. Every time my printer powered up, it came up in the вЂњMaintenance ErrorвЂќ mode. I tried running your EPFWUPD program and it recognized my printer but wouldnвЂ™t let me reload the previous firmware version, instead it said my printer's Status was "Downgraded (It cannot be Updated)". I have since bought and installed a genuine Epson cartridge. I'm out of Maintenance Mode but I still can't get my printer to go into вЂ?special Firmware Update ModeвЂ™. Does the downgraded status mean my machine can't use your product to go Chipless? How have you tried to enter in Program Update mode?? Can you reactivate an expired activation key? If This (D9755272-5B52FE93-463-XXXXX) key then it does not work. Hello, any support for this model SC-P807? I made my WF-3640 as Chipless just a few days ago. There was no Problem. But, unfortunately I've found one serious issue. The 2-Sided Printing Speed got much slower because of the "Dry Time". WF-3640/3620 firmware has very good 2-side printing speed. But the current Chipless firmware ruins it. I have two more WF-3640, and I have plan to buy WF-3720, Wf-7710 soon. But I have to hesitate to load that chipless firmware. If the problem is not solved, Maybe I wouldn't pay for those Chipless firmware. Please, Check it and re-make new chipless firmware based on the latest original firmware. The above Youtube film shows No warning message and No delay at duplex printing of original firmware. I paid and loaded the chipless firmware on my WF-3640 a week ago. But, it's gone today. New original firmware has been loaded. My one employee just installed printer driver...and I think he just cliked "Yes" at every step including "update software option". Anyway, I had to install ciss chips again. Now the firmware version is CB18I4. It was OK because I didn't like the slow duplex printing(Long dry time) of Chipless firmware. But, I found out the Slow 2-sided printing Speed was NOT recovered. It's still Slow. So, I guess, the latest firmware of epson has long dry time as default unlike previous version. But, I am not sure. I purchased it on March in 2018. I don't know what firmware version it has. I know only one thing it had 0 second-dry time as default. Super fast duplex printing. Unfortunately, I think I wasted my money. Is it wright? I have to pay again to recover to chipless firmware, don't I? Can I get the key one more time to recover? 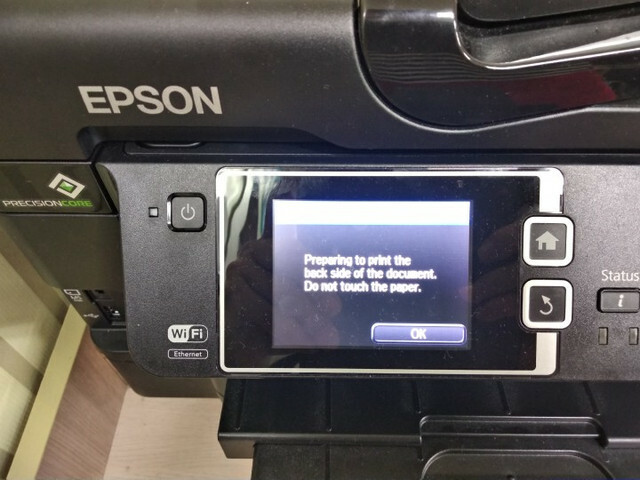 or can I use the previous key at the same printer? My printer has just comeback to normal firmware with super slow duplex printing speed. I am waiting for some reply.